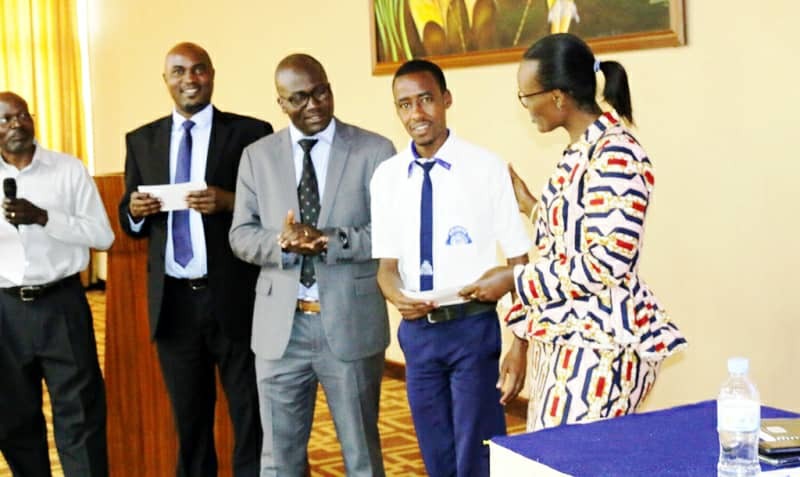 Rwanda Education Board has awarded cash prizes to top 10 students among 409 that participated in an EAC essay competition. Dr. Irenée Ndayambaje, the director general of Rwanda Education Board (REB) dished out $300 to the first winner, the second $250 and the third $200, the fourth $150 while the fifth was given $100. Meanwhile, five other students were given $50 respectively. Dr Ndayambaje said that the five first winners in this competition faced off other East African countries that had also scored the highest points compared to their peers, hence a reason to trust Rwanda’s education system. “Our children must have the culture of reading and writing so that they may be able to brave competitions and win them thanks to the knowledge they get from books.” Ndayamabaje noted. Allegra Nshuti a senior- three student at Ecole de Sciences de Musanze was first followed by Jessica Mukundente also a senior –three student at FAWE Girls’s School. The schools that sent the best students were also given awards. Ecole de Sciences de Musanze was given technological tools worth $1200 while the second FAWE Girls’ School was awarded ICT gadgets worth $100. According to Dr Ndayambaje, these essay writing competitions were carried out in three languages used in East African region namely English followed by French and Kiswahili. He reminded teachers to scale up efforts in teaching some courses including languages, especially English because it is used in schools curricula from P4 to university level. Dr Ndayambaje said that an English exam is projected for all teachers at primary, secondary and university schools in order to inspect whether they have mastered language. The essay competitions started in 2009 but the number of students participating is still low. This year’s theme is about how education and technology can benefit EAC population.